A product of the U.S. National Arboretum, the Thuja Green Giant, also known as Thuja standishii x plicata, is a fast-growing evergreen tree that can grow as much as 5 feet each year. Mature Thuja Green Giant trees can grow up to 80 feet tall with a 20 foot spread. The fast growth rate, coupled with the tree's attractive conical shape, makes Thuja Green Giant a popular choice of landscaping tree. Thuja Green Giant performs excellently when grown as a windbreak, hedge or privacy screen. This simple-to-care-for tree can be grown in USDA plant hardiness zones 5 through 8. Thuja Green Giant is a popular choice of tree for privacy screens and hedges. Select an appropriate planting location for your Thuja Green Giant tree based on its growing requirements. Choose a full sun or partially shaded location where your Thuja Green Giant can receive up to six hours of direct sunlight each day. Clear the area of vegetation and debris to prepare it for planting. Plant your tree in rich, moist, well-draining soil at the same level it was planted in its nursery container. If necessary, amend your soil with aged manure, peat moss and perlite to improve aeration and drainage. For best results, plant your Thuja Green Giant approximately a month and a half before the last frost of the season. Water your Thuja Green Giant tree regularly to keep its soil nice and moist. Frequent hydration is especially important for young trees that are struggling to establish themselves in a new location. Water your tree with a drip, soaker or bubbler hose so that you can be sure that the moisture is able to reach the roots. Fertilize your Thuja Green Giant tree three times a year, in April, May and August, to ensure that your tree is receiving the nutrients it needs. 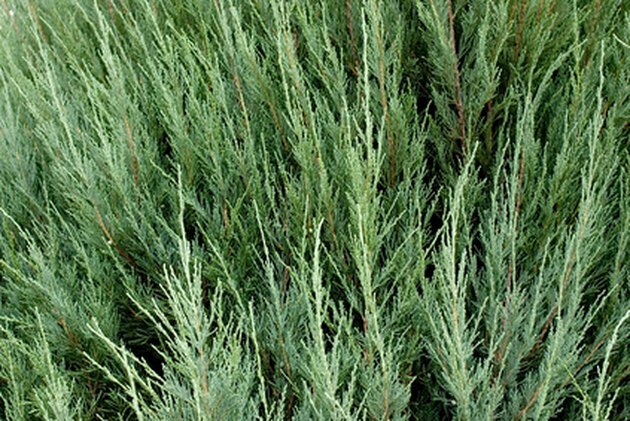 Use a specially-formulated evergreen fertilizer when feeding your Thuja Green Giant. Apply a half-strength dilution of fertilizer for the first year of growth to avoid burning your tree's sensitive young roots. After the first year of growth, apply your fertilizer according to the directions on the package. Trim discolored, diseased or damaged foliage from your Thuja Green Giant tree as needed to maintain your tree's appearance. Thuja Green Giant trees need no additional pruning to attain their beautiful conical shape.